Offering plenty of practice for vocabulary learners, these small and easy-to-carry books are ideal for busy people to use outside the classroom. All the words have been chosen using the Cambridge International Corpus to ensure that students learn the most widely used vocabulary. 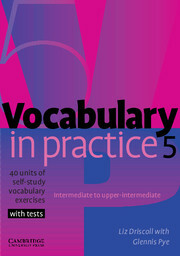 Includes regular tests and helpful word lists. 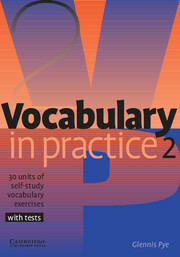  Ideal for self-study students who wish to practise their English vocabulary outside of the classroom.  30 units of enjoyable, quick-to-do exercises with test units after every 10 units.  Small, easy-to-carry book designed for busy people to use when on the move.